If you’re really willing to look deeply into your authentic self, listen to your soul’s whispers and find out who you really are meant to be, it will lead you to a fulfilling and joyous life. If you’ve ever felt “stuck,” author Vicki Todd says it’s likely due to an unclear understanding of one’s life purpose. Through self-reflection readers will be able to find and fulfill this purpose in order to get more out of life. 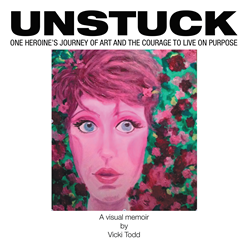 “Unstuck: One Heroine’s Journey of Art and the Courage to Live on Purpose” helps readers do just that through a series of reflective activities that also encourage creativity through art journaling. The book is a visual memoir in which Todd tells her story of “flipping” her life twice from nonworking wife in a failing marriage who lost a baby she wasn’t meant to conceive to university professor to resigning from her tenured position to follow her bliss of art. Todd illustrates her journey of self-discovery through a series of expressive self-portraits she painted while pursuing her unique calling. Todd uses her personal and professional experiences to lead others to find their purposes and “unstick” themselves from life. Through her art workshops, Todd helps women identify and cultivate their true selves and create a plan for pursuing their paths. For more information, visit vickiworldart.com. Vicki Todd is a memoir artist, Ed.D.,and life coach. She teaches Honor Your Purpose art workshops designed to help women identify and cultivate their true self and life purpose through art journaling exercises and a vision canvas painting. In addition to authoring “Unstuck,” Todd wrote a chapter in “20 Beautiful Women Volume 2: 20 More Stories that Will Heal Your Soul, Ignite Your Passion, and Inspire Your Divine Purpose” and has also been a featured blogger on the Huffington Post. In addition, Todd works as a motivational speaker and spreads the message that living your life's purpose by using the gifts you were given at birth to make the world brighter leads to a more joyous and fulfilling life. In June, Todd will become the executive director of VALA Eastside, a nonprofit arts organization in Redmond, Wash.
Todd’s art is also featured on VIDA fashion apparel at http://www.shopvida.com/collections/voices/vicki-todd.